Glitter Bars & Glitter Counters - Glitter My World! The following is here to give you an idea of the steps it takes to do a glittered bar or counter. Be sure to follow the manufacturers instructions and run tests! It is important to always test your glitter and materials before you begin and large scale project like this! Epoxy-coated bars and counters are really the best way to go for high quality beautiful results. It gives you that glassy smooth look and is incredibly durable. We recommend the Ultra Clear Epoxy brand as it is commercial grade. There are plenty of other brands out there that cost less, but sometimes those cheaper brands don't give you that perfectly smooth surface (especially if you go with chunky glitter flakes). This product comes with full instructions and videos. However, we do want to go over how to use it with glitter. If you watch the Ultra Clear Epoxy video below- you will see a first coat being laid down with a brush. That is going to be the glitter step! 1. Make sure your bar/counter is very clean and ready to seal. 2 Option A: Mix the glitter and some of the epoxy mixture together and hand brush onto the bar/counter. Make sure you have it as heavy or lightly covered with glitter as you like. The glitter flakes will not change position, so the way it looks at that moment is going to be the final look. 2 Option B. The other option is the lay down a coat of the epoxy and then sprinkle the glitter on top making sure it is just the way you want it to look finished. Be sure to press the glitter into the epoxy so that it sticks. Note: If you choose this option you may end up having to do two pour coats to make sure you have the perfectly smooth surface you want. 3. Wait for 4 hours (other brands the time may vary). During this time, the epoxy will set a bit and hold the glitter in place so it won't float around during the final pour coat. However, there may be loose pieces and now is a good time to lightly brush them off or vacuum them off (don't touch the surface with the vacuum wand!). 4. After the wait time and after you brushed off any loose glitter, begin the final pour coat per product instructions. 5. Use heat gun or propane torch to get any bubbles out. Polyester Glitter can be heated up to 350 degrees so it is OK to use heat as long as you do not sit in one area for very long. 6. If you have glitter coming to the surface then you will need to do a second pour coat. Fortunately, the Ultra Clear Epoxy brand allows you to do this (see their instructions). 7. Wait 72 hours for it to cure before use. Note: One of the main reasons we like this product for doing a glitter bar is that the pour coat is a full 1/8" thick! This is super thick and will cover all the glitter and still offer the super smooth surface. It also allows for multiple coats if needed. The company also answers their phone and really knows how to use their product. Depending on the look of your bar or counter, you may want full coverage (glitter covering every inch) or you may just want an accent of glitter. To do accents, and really make your glitter pop, it usually smart to paint your bar a fairly dark color or go with classic black. The metallic glitters, holographic glitters, and clear iridescent glitters are really going to look best over the dark background. Basically, you will follow most of the 7 steps given above (for full coverage), but you will be adding in the prep step of painting your bar/counter. It is recommended that you do this some days in advance so there is no chance that your paint is not completely dry and ready to be sealed. If you seal wet paint you are going to be really unhappy with the results and have a big mess on your hands. Instead of mixing a lot of glitter into the brushed on first coat, you will be putting in a lot less glitter. 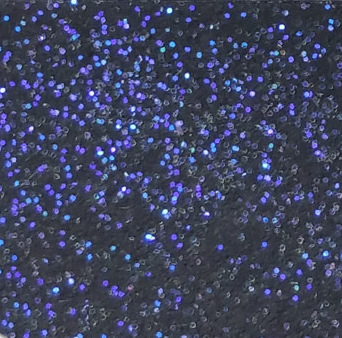 Using the 5 iridescent solvent resistant glitters we sell over black is a gorgeous effect. However, you can certainly use one of the metallics or holographic glitters too. Just make sure you use Polyester Glitters that say they are solvent resistant. Flake Type: The flakes need to be polyester glitter and they really should be epoxy coated. This means that the Metallic line we offer is going to be the best. However, you can generally use any of the solvent resistant glitters (test first). That would also include Pearlescents, Iridescents (only the clear ones that say they are solvent resistant), and some Holographics (not the cosmetic ones). We have a website that only sells appropriate glitters called GlitterForFloors.com The glitters sold on that site love epoxy. Flake Size: This is a personal choice, but keep in mind that the larger the flake the bigger the sparkle. If you want to knock socks off, then going with the Chunky flake 0.040 would be the way to go. Need a more subtle look then the Ultra Fine flake 0.008 is a good choice. Need more options? You can get just about any flake size you want is you buy a 10lb box. Every glitter we sell comes with a picture like the one shown above that will give you a chance to see the flake size up close. If you are using the brand we recommend (Ultra Clear Epoxy Coat) then you can get away with the larger flakes. It lays down a full 1/8" layer of epoxy!. Other brands of Epoxy-Coat are often only half as thick and larger flake glitters may not be completely coated. REMEMBER TO TEST ALL GLITTERS AND PRODUCTS BEFORE BEGINNING YOUR PROJECT. USE OUR SAMPLE SERVICE TO AVOID EXPENSIVE AND TIME CONSUMING MISTAKES!